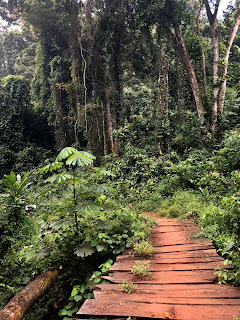 The Liberian Bush is a thick jungle teeming with wild animals, beautiful foliage, and bugs big enough that they seem like they could carry you away. Occasional tight paths cut by humans and lined with razor grass were many times the only sign that we were not alone. Roads can only take you so far, and my day began with that reality. Toyota Land Cruisers are the vehicle of choice in Liberia and rightly so. 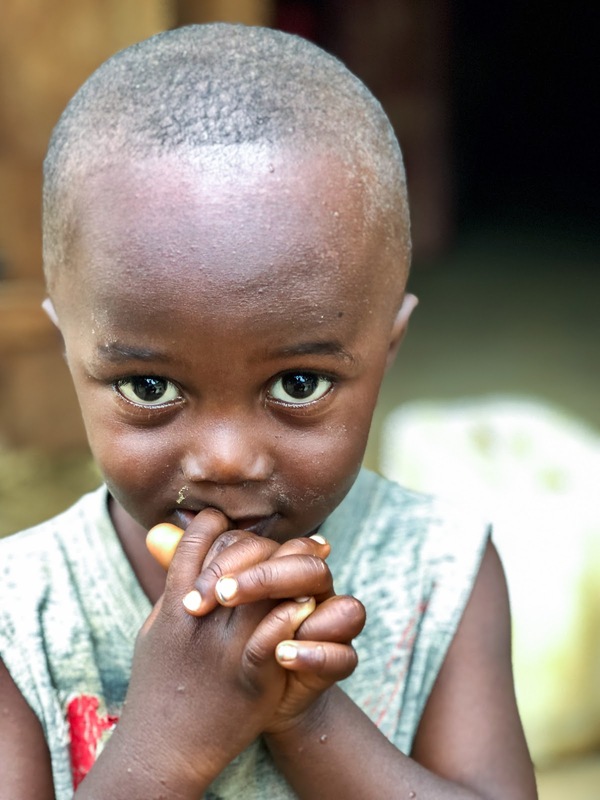 They are tough and can climb almost any terrain, but in the Liberian Bush, they have their limitations. As we made our turn form the main highway, the lightly damp, red dirt road had many signs left over from the rainy season. Smooth patches of the road became scarcer the deeper we went, eventually leading us to the end of the road and to the banks of the St. Paul river. 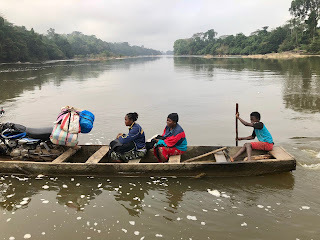 I had crossed this river a year ago using a canoe that barely could float, so the idea that today we would cross on a “ferry” was a little sketchy. “What do you mean by “ferry?” I asked my hosts. I would soon find out. As we parked the Land Cruiser and walked to the banks of the river, we were met by the owner of the area we were in. Turns out, he had been very helpful with transporting the clean water filter systems we use to the other side of the river banks. 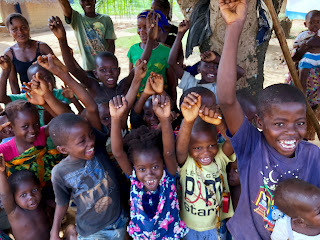 With great joy, he welcomed us and thanked us for bringing life-saving water filter systems to their district. He shared with us that his family was the recipient of a system and it had changed their life. 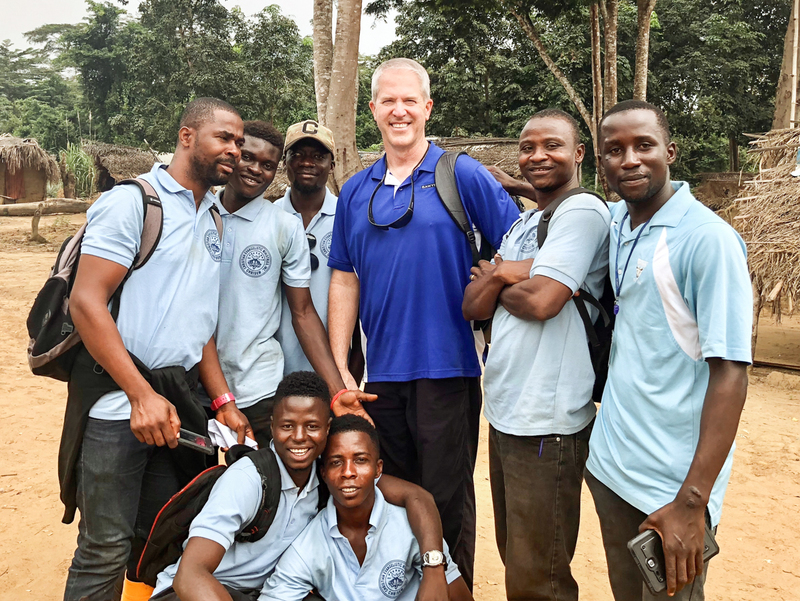 They all used to have frequent cases of diarrhea but since receiving the filters, their stomach sicknesses had vanished. 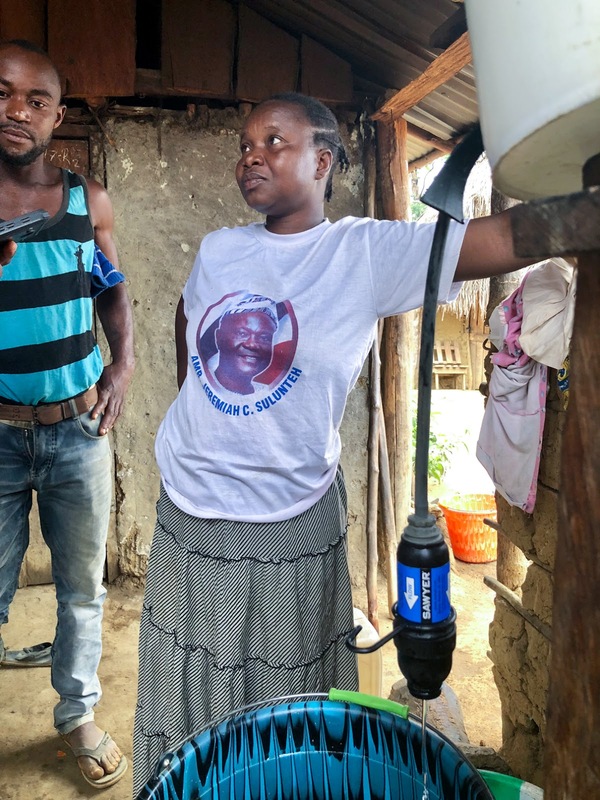 He was so happy that every family in Liberia would have access to these water filters. After the customary Liberian handshake, a shake and snap of the fingers upon exit, we made our way to the ferry. I could see that the ferry was on the other side of the river. The government had recently dedicated this ferry to the area. It was a large flat barge, maybe 16 feet wide by 30 feet long, with side rails and a tarped covering. 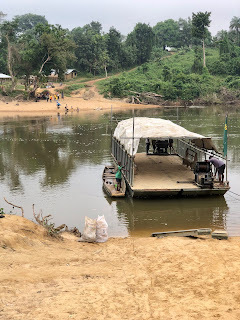 There was a large cable that stretched from one side of the river to the other and the hand-cranked pulley system on each side of the ferry would serve as the “motor.” Two very lean young men would take turns and provide the cranking power to move the ferry from one side of the river to the other. Each guy cranked the entire width of the river. No CrossFit needed for these guys. They were cardio kings! We loaded a few motorcycles onto the ferry and slowly crossed the river. Upon reaching the middle section of the river, I couldn’t resist snapping a few shots as canoes paddled by us making for a very picturesque setting. When we reached the other side, we were greeted by the rest of our clean water team. There were great smiles all around as we were reunited once again. 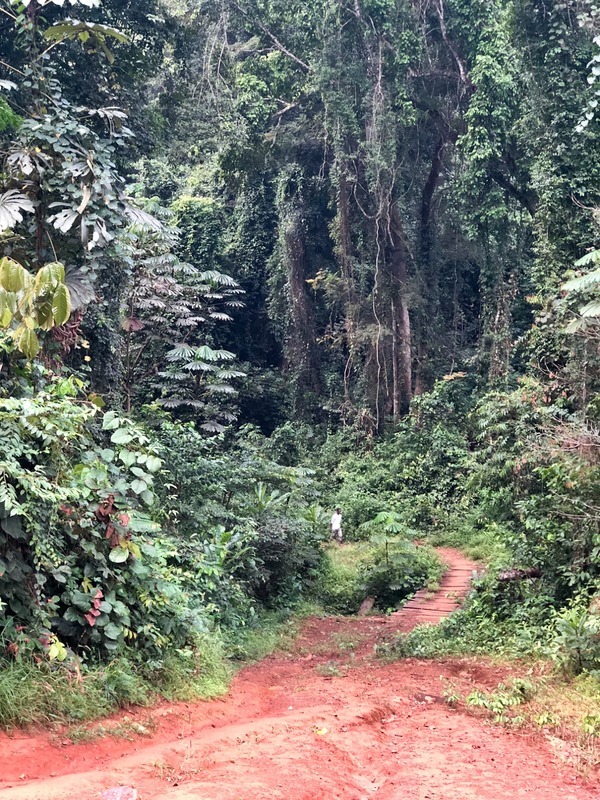 After a little hike up the hillside, we all got on motorcycles and began a 1-hour ride on a narrow jungle path. Riding motorcycles is a mixed bag for me. On one hand, they are so liberating as you feel as though you are one with nature. They also can go where no car can go. 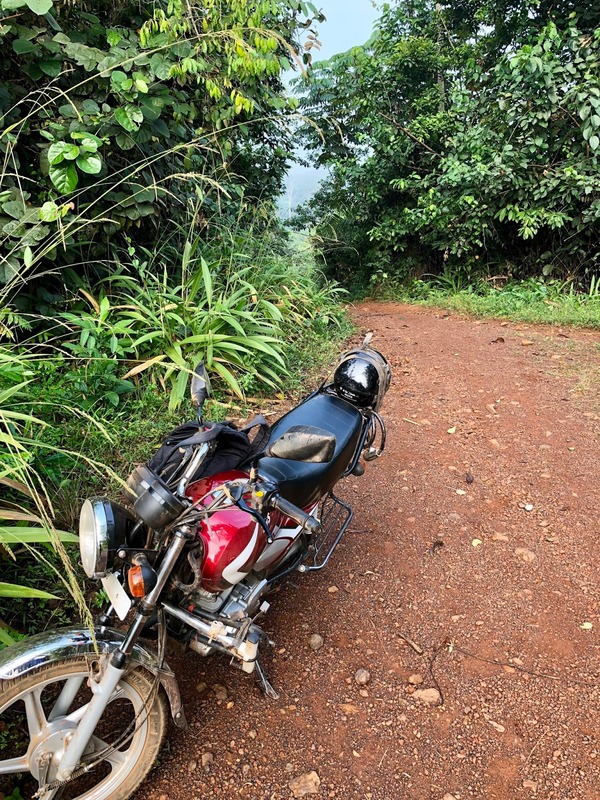 On the other hand, you are riding on the back of a motorcycle with no helmet on a slippery dirt path making your way to the middle of nowhere in the jungle of Africa. Fortunately, we couldn't move that fast so the thought of falling off wasn’t that scary until I thought about the idea of breaking a leg in the middle of nowhere in the jungle. Now that would be a super bummer! One of the greatest thrills of this ride was passing by village after village that had already received clean water filter systems. 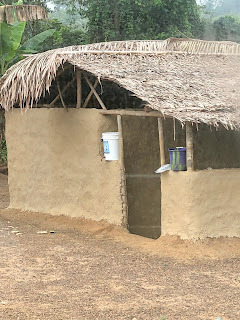 Since it was morning time, all the huts had their filters outside filtering their morning 5 gallons of water for their family. It was quite a spectacular sight and I was so proud of our team for all of their hard work. So many tens-of-thousands of people had already had their lives changed and I was witnessing it with every village we passed. After our 1-hour ride, we finally came up to our target village of around 50 mud and grass huts and were greeted by lots of smiling faces who had recently received filter systems. Today would be the second time in 8 weeks that they had received a follow up by our teams. 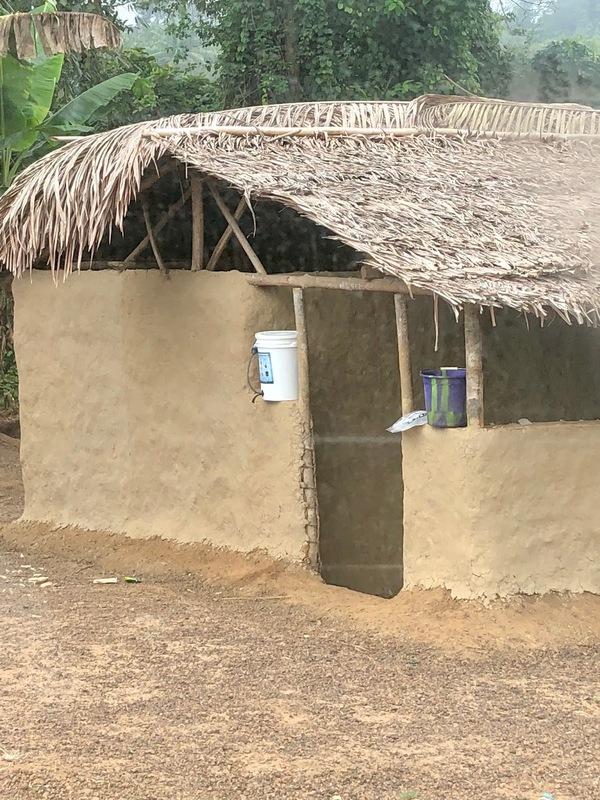 In addition to tracking whether or not the villagers have mastered the usage and cleaning of the filters, our teams documented any further reductions in diarrhea, school and work days recaptured, and any financial benefits of using the water filter systems. The data on this day would once again demonstrate the incredible impact these filters are making at changing lives! As we finished our day, the thought of making the 1-hour journey back to the Land Cruiser was mixed. “Let’s not crash” was at the top of the list for me, but no sooner than those thoughts came out of my mouth, we had an accident with another motorcycle coming from the other direction. Typically, it is customary to honk your horn when going around blind corners. The road that we needed to ride on cut right through the village huts we were visiting. We needed to make a sharp left hand turn around a grass hut in the village so we gave the horn a beep. 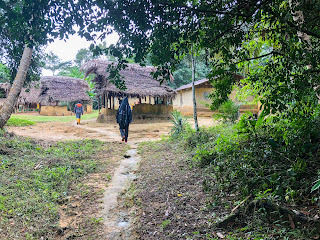 Right as we did, another motorcycle rounded the same hut from the opposite direction, loaded with supplies he had recently purchased. We slowed down, but the other driver slammed directly into us. We stayed upright but he laid his bike down. Fortunately, nobody was hurt. The other bike had a little, broken piece of plastic, but we all were somehow uninjured. That was a relief! And now you know just one of the reasons why we need everyone to pray for us while we’re out there. 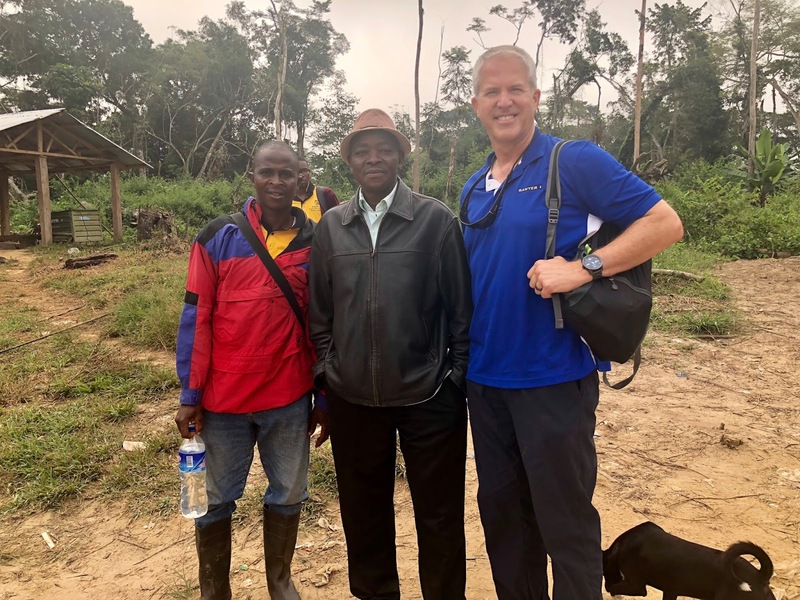 As we moved on through the jungle, the thought came to me that our teams really do go where no one goes to ensure that every man, women, and child have clean water in Liberia! That is a fact that will be accomplished by December of 2020. Before we blink, an entire country will have border-to-border clean drinking water. Take a deep breath because there is much work to do! 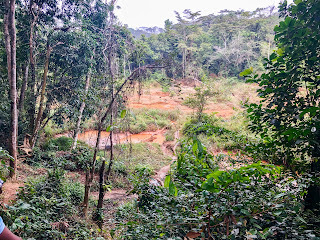 I had no idea that today would be filled with mountain climbing, sliding down hillsides, laid down motorcycles, black ant attacks, gold mines, lots of sweating, and yes, lots of clean water. Driving into the middle of the African bush can be a little intimidating. Dirt roads that cars can easily drive on quickly turn into dirt paths that test the limitations of the best 4-wheel drive vehicle. 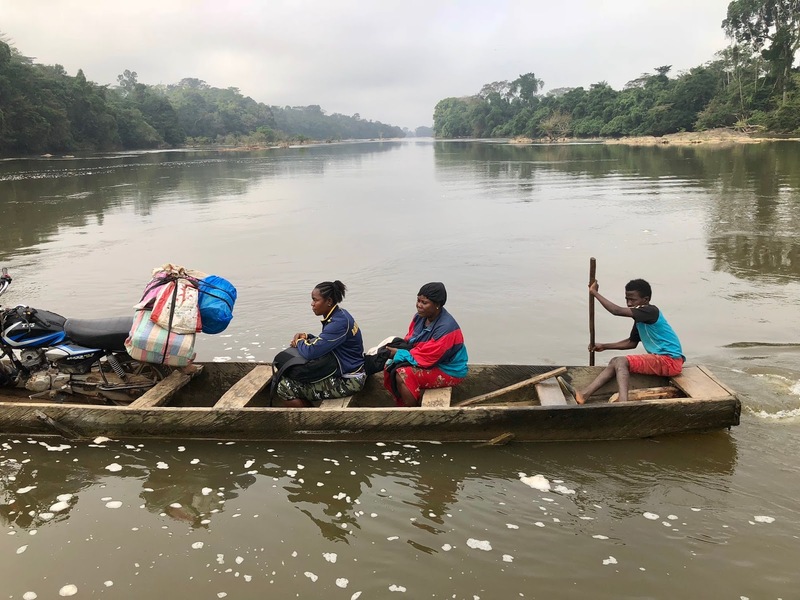 If you want to give clean water to every village in Liberia, you’ll have to start with those paths and usually end up at a broken-down bridge. That’s where we parked our 4-wheel drive today. 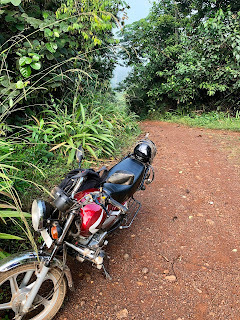 Fortunately, we had 5 motorcycles with us so I jumped on one of them which is really not one of my favorite things to do on a slippery dirt path. We finally reached the top of the hill where we all were gasping for breath. In what seemed like a miracle encounter, a young woman walked by us carrying a large plastic bowl of bananas. For $3 we cleaned her out and got a little energy. 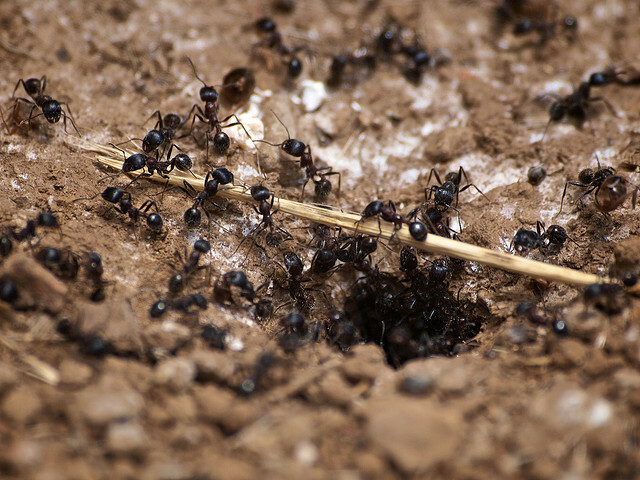 While I was standing there, I failed to realize that I was standing in a black ant frenzy. One of the motorbike riders pointed them out to me and that set off a race to get them off of me. We saw them in my socks, but those little things must be really fast because in a matter of seconds, I could feel them climbing up the inside of both my legs. There were even a few that had already made it up the outside of my pants and had climbed inside my shirt! Thankfully the ants were not hungry and I didn’t get one bite! I was just a little freaked out though. Off on the path we went again, scaling the hillsides briefly by motorcycle until the path became unpassable. We found that out after one of the riders laid down his bike. 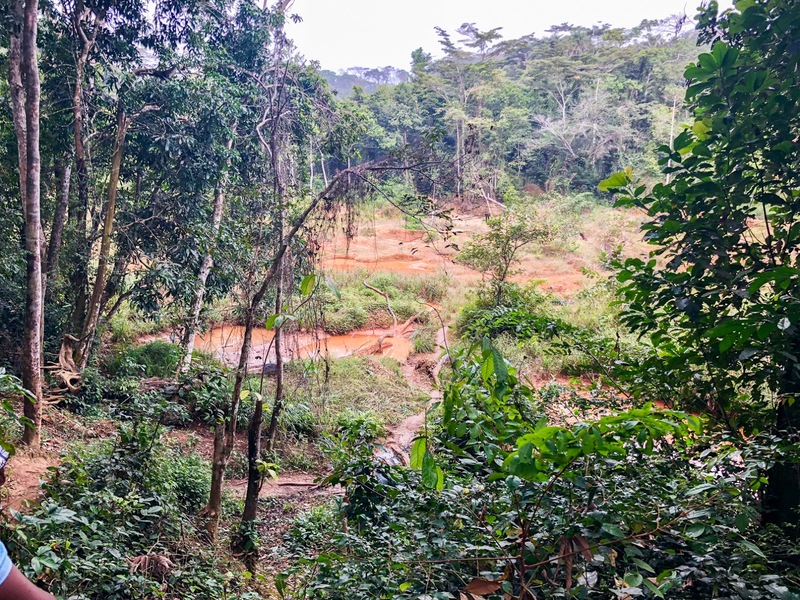 Fortunately, he wasn’t hurt, and so we began walking until we finally reached a valley that turned out to be a gold mine. Yes, a literal active gold mine. There were a few people digging for gold, but we passed on the temptation and pressed on towards the village. Up another giant hill, we went slipping on the slick path while listening to the sound of what sounded like giant birds. Turns out, they were giant birds nesting high in the jungle treetops. They looked like some kind of Toucan with their giant beaks. Once we reached the top of this last hillside we FINALLY reached the village of 120 grass huts. 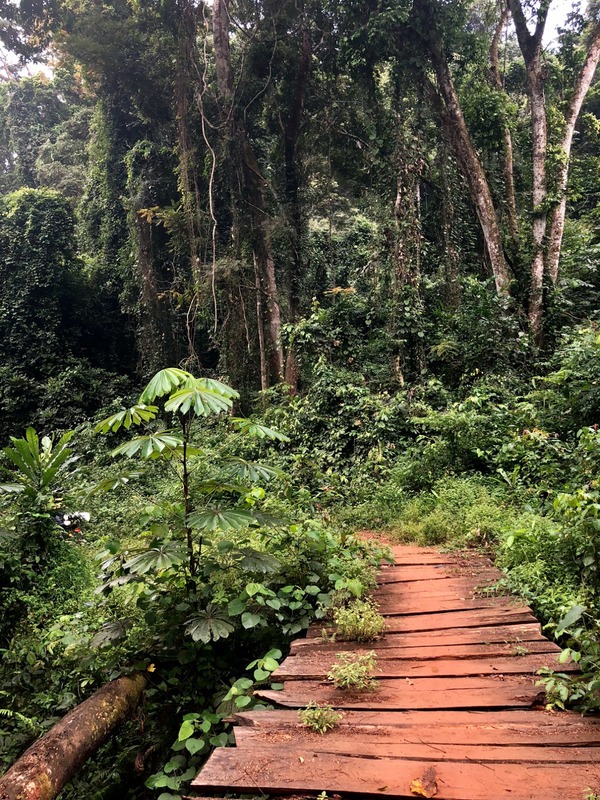 It was a pretty awesome sight to behold and probably my favorite in Liberia so far. We were there to follow up with this village that had recently received clean water systems. What would we find? Would the villagers be using them? This village did not seem like it was very sanitary but I still had high hopes that the villagers would be using and enjoying their filter systems. As the town chief approached, we were greeted with a big smile, and a very warm thank you! He said that their village used to always have diarrhea as they all drink water from the local creek. But since they’ve received their filter systems, all of their diarrhea has disappeared! They were so happy! Of course, I wanted to see the filters in use for myself so we could collect data on this life change. One-by-one, we went to each house. They were ALL using their filters on a regular basis and everyone was able to demonstrate proper use of the filters. We did give a little coaching to a few villagers teaching them to clean their filters systems right after they filter a bucket of water, but for the most part, this village was a home run! My favorite part of the day was at the first house I visited. There was a little 2-year-old boy who immediately began calling me Papi. He came right up to me and wanted me to hold him which was so precious! He ended up following me around all day. As we finished up the last follow-ups, the grueling thought came to my mind that we’d have to leave on the same path that we came in on. Well, we took a deep breath and started our journey. Needless to say, I was pretty tapped out after this journey, but it reminded me of just how hard these teams work every day to make sure every village in Liberia is reached with clean water! The NGO teams are the real heroes of this story. I’m glad I experienced everything I did today! I have a new level of respect for those who do this day after day. No wonder they are so lean and fit!